Beef sticks, papaya salad, and salaw machu kreung. Southeast Asian street food has made its way to upscale restaurant menus in recent years, where beef skewers might make themselves at home alongside soju cocktails and caviar flights. There's no doubt in my mind that street food belongs in a venerable setting like this, with the price point to match — it's food that takes effort to prepare, with big flavors as a result. But Cambodian Street Food feels like a refreshing return to street food's roots. It's a humble, cash-only take-out joint, where customers place orders through a tiny window. Prices are exceedingly reasonable: an egg roll for 80 cents, three beef sticks for $5, or three banh xeo, or savory egg crepes, for $10. During peak times, you'll see cars double-parked on both sides of the street as customers rush to the window to pick up their orders. If it's sunny out, families might perch themselves at the restaurant's single outdoor folding table and dig into their food while it's fresh and hot. While I waited to pick up my order one weekend afternoon, a customer clad in sweatpants walked up to the window and ordered the chicken cha kreung, a dish of chicken, bell peppers, and green beans stir-fried with lemongrass. "I'm too lazy to make it myself today," she said, "but you guys are the only place that makes it authentic." 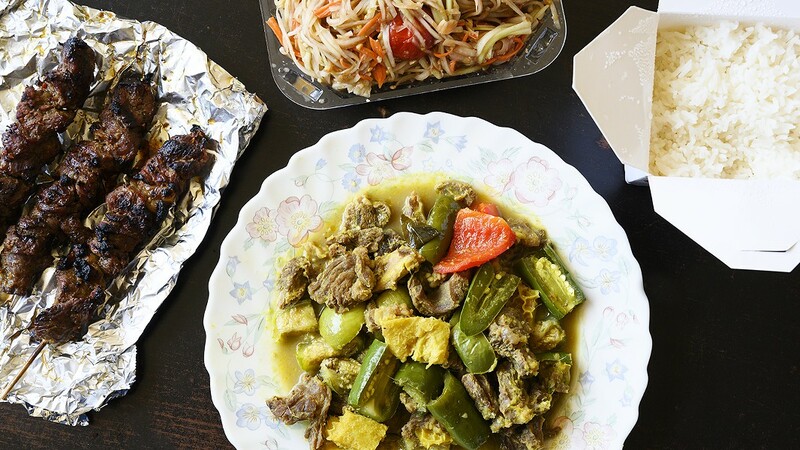 Owner Malinda Bun opened Cambodian Street Food in November 2018 to showcase the cooking skills of her mother, Mach, who grew up in Cambodia. "My mom, she came from a very sad past, with the Khmer Rouge war," Bun said. "Since she was a child growing up in the villages, she would watch the older people cook in front of her. And she remember[ed] the ingredients, and she brought it back with her to the States." Bun said the recipes you'll find at Cambodian Street Food are similar to what her mother cooked for her while she was growing up. "I was born here in the States, but my mom, she always wanted to keep the culture going, and hav[e] my siblings and I not forget our culture and the traditional food." If you're in the mood to share, the prahok ktiss — a dip made of pork, fermented fish, coconut milk, tiny eggplants, and peppers — is an excellent option. I loved the contrast of the slight creaminess from the coconut milk against the savoriness of the pork. The tiny eggplants, which resembled olives, took me by surprise as they burst in my mouth. The dish came served with fresh veggies for dipping, including cabbage, cucumber, and slices of a larger, raw baby Thai eggplant about the size of a golf ball. The other appetizers are pure comfort food, as evidenced by their names "Mama Wings" and "Mama Egg Rolls." Bun explained, "Growing up, my mom loved cooking for everyone, and when she cooks, she makes big portions. So everyone calls my mom their mama." The egg roll had a nice flaky crunch on the outside, though mine was understuffed. But the wings struck just the right balance of light, crisp breading that shattered with each bite. The jalapeño and roasted garlic on the side dialed up the heat, and a splash of fish sauce added sweetness to round out the flavor. Bun said the banh xeo — eggy, savory crepes stuffed with ground chicken and bean sprouts — were one of the most popular foods when she visited Cambodia a few years ago. They're served with lettuce, cucumbers, and mint for wrapping, and fish sauce to tie everything together. The crepes were thin, yet bursting with the rich flavor of egg — a pleasant contrast to the mild flavor of the ground chicken and bean sprouts inside. The salaw machu kreung, Bun said, is another popular street food. It's a rich lemongrass soup made with beef and beef tripe, with a hint of sweetness from the eggplant, bell peppers, celery, and onions. The beef was tender, the honeycomb tripe crunchy and bouncy, and the vegetables melted in my mouth. Chicken cha kreung is another best-seller, both here at Bun's shop and on the streets of Cambodia. It was also a prominent dish in Bun's childhood. "It's something that my mom was always making at home," she said. The chicken was finely chopped and stir-fried with copious amounts of zingy lemongrass paste, while the bell peppers and green beans added crunch and sweetness for contrast. But the dish I was most impressed with was the steak and prahok. It's a simple-looking dish of grilled steak served with lettuce, cucumbers, mint, and plain rice, plus a container of prahok sauce. Prahok, for the uninitiated, is a Cambodian fermented fish paste. Here, it gets mixed with lime juice, Thai baby eggplants, Thai chilis, jalapeño peppers, cilantro, and roasted garlic. The result is a sauce that's got an umami flavor reminiscent of Parmigiano Reggiano, balanced by notes of sourness and spice. The steak was incredibly tender and cooked medium-rare as requested. When I wrapped it with the lettuce and mint and dipped it into the prahok sauce, I found the combination of crunchy, fresh greens combined with the funky flavor of the prahok irresistible. I couldn't get enough of that contrast, and the entire plate disappeared within minutes.